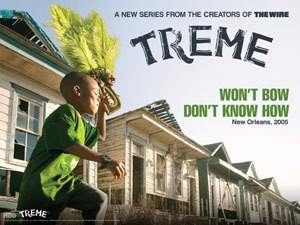 We think Treme is a great Tv Series and this is a Teaser trailer for season 2 featuring a great poem by Gian Smith called “O Beautiful Storm”. Gian Smith had been invited to perform his poems at an October Tulane symposium on Treme that was filmed for HBO’s website. His conflicting feelings about Katrina and what it meant to him, his family, and New Orleans residents resonated with the HBO team and spread to the show’s producers. They hadn’t necessarily been looking for a poem to capture the complicated emotions of Katrina’s survivors, but they couldn’t pass it up when they found it. Please see full poem Below. This entry was posted in News and tagged News, Viral Video. Bookmark the permalink.